Ahhh, the cookie tray at parties! How can anyone resist? The cookie tray is a big deal where I come from. At every wedding, funeral, big event, the cookie tray is super important. I’m not sure if this is local to the Pittsburgh area or that my lovely Aunt Rita and Aunt June just dig making as many cookies as possible. What do you think? Are you a big fan of the cookie tray, too? 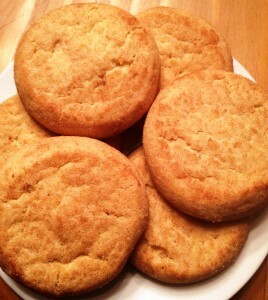 Now this vegan and gluten-free version of Snickerdoodles are super delicious and will be a great cookie tray favorite. In a medium sized bowl, combine dry ingredients and mix well. In a separate bowl, mix together the oil, honey and vanilla. Add the liquid ingredients to the dry and mix until combined. Using a melon baller, scoop out the dough, and then gently form into a ball. Roll in the cinnamon. Place the balls of cookie dough on a parchment lined baking sheet. Use your hands to flatten each cookie. The bottom of a glass jar will also work beautifully. Bake for 8 minutes. Cool for 10 minutes. Serve. 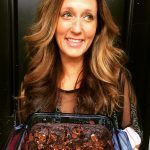 Want more delicious, clean dessert recipes? 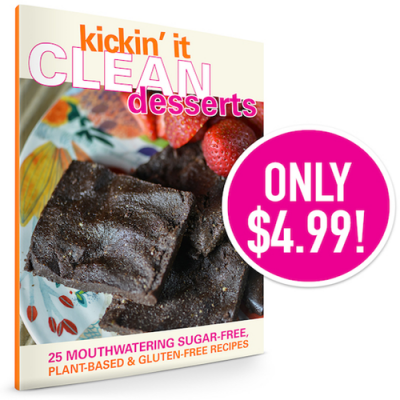 Check out Kickin’ It Clean Desserts – 25 mouthwatering sugar-free, plant-based, and gluten-free recipes. I’ve gathered my favorites all in one book. Lisa, you’re not going to believe this but, Dan has an Aunt Rita in Pittsburgh who makes cookies!! Haha! Can’t wait to try these Snickerdoodles!! 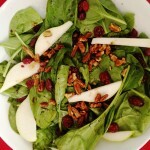 These not only sound delicious but easy too! Can you tell me what type of honey you use? I really would like to get a local raw honey since my middle son has asthma and I know exposure to local pollen can help! VERY easy, Nicole! I mean easy! AND as for local raw honey, do you know Peri Lane? She is a friend who sells local raw honey. Here is her email addy: peri@apisproductions.com. I believe she sells her honey at Level downtown. 🙂 Hope you make these little treats! Lisa, I thought it was an Italian thing. My mother in law had to have trays of cookies at our wedding 30 years ago. Ahhhh, I didn’t even think about the Italian thing. That makes sense…my aunts are Polish and Italian. I can just imagine all the delicious cookies at your wedding! Thanks, lovely! I like that coconut flour! So I made these the other day. I am a Snickerdoodle snob. I love my “traditional” butter and flour variety, plump though not flat. My husband and I are, though, for the most part very healthy eaters and do our best not to eat baked goods. But I love making my Snickerdoodles during the holidays. Anyway, we gave these a whirl. I did not have any raw honey so used raw agave nectar. I am not sure if there is a huge difference, but in either event they turned out to pretty darn good. Actually – my husband loved them. I suppose from the almond meal. Too many nuts have been known to cause this. Do you have any other suggestions for an alternative ingredient? They ARE darn good, aren’t they? I would suggest coconut flour…I didn’t hear of any reactions before, but for your body, this might be a better alternative. 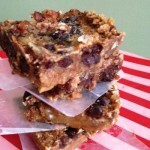 Agave is also a great natural sweetener to add to these treats. 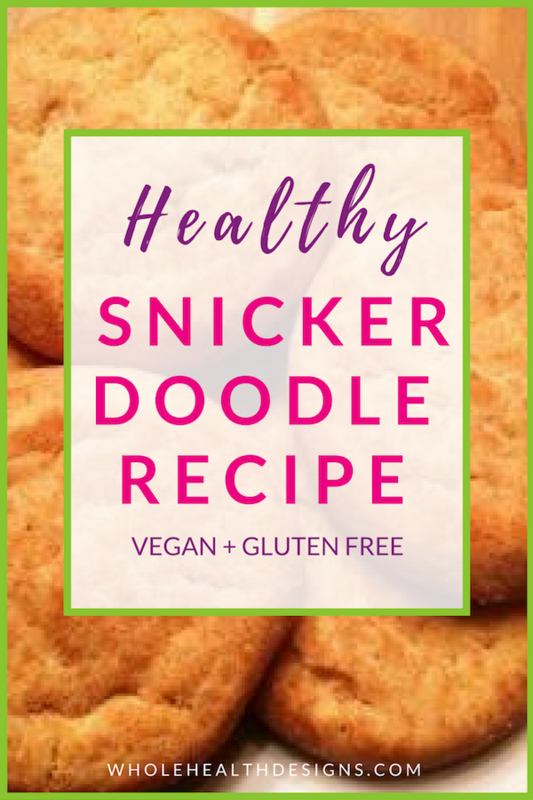 I’m so thrilled you made them and I’m honored that you, a snickerdoodle expert, enjoyed them! These are just fun ways to clean up a treat. Thank you so much, Erin! Okay – I tried the coconut flour…It is incredibly dry. I even tried another recipe also incredibly dry. From some of the other blogs or articles I have read for GAPS, they seem to mention the this is typical and the only way is to up the use of eggs, which this does not call for. Do you have any other ideas or suggestions? Thank you!